If you’re interested in learning more about the science behind IF( intermittent fasting ), or the different ways you can do it, I employed these three articles as guides. Like I said, I’m not a nutritionist, and I truly don’t want my admonition here to be the last word on whether or not you embark on a major diet change. Delight believe me–it is a MAJOR change. I understood the merits of the communication of IF in two ways before starting. First, I learned that a time period of fasting decrease insulin production and boost growth hormones–both of which mean good-for-nothing to me, but they apparently help boost metabolism, burn fat, and gain muscle. Second, by limiting your “eating window”( a period your best friend would literally pay me to stop hearing at this object ), you’re meant to limit overall calories( e.g. you can’t eat breakfasts anymore; you bounce seven breakfasts’ value of calories per week ). Have some objections to that second point? Yeah, me too–don’t concern, we’ll get there. But only made very clear with my intentions for IF: I wanted to lose weight. Not a drastic amount, especially not in 10 days; I know all too well that that weight just comes right back. But losing perhaps 1, 1.5 pounds? If nothing else, only been demonstrated that my torso was still capable of weight loss after all the odd diets I’d applied it through. So, I decided on a 16:8 routine( 16 hour fast, 8 hour chewing window ), and went off on my 10 -day journey. Despite most the relevant recommendations of 16:8 proposing feeing 12 -8pm( or even earlier ), I specify excavation from 2-10pm. First of all, I struggle style more with snacking at night than I do during the day, and I didn’t want to set myself up for failing. Second of all, I have a standing Bachelor appointment Monday nighttimes, and no way in blaze was I sitting through Colton’s journey for love without a health dosage of wine-coloured and pizza. The first few days were mostly the same: I showed up to work around 10( usually when I eat breakfast) and had disagreeable but bearable waves of hunger until 2pm. This included stomach contractions( worst when I woke up, or when someone ate a delicious-looking bagel near me ), and a few headaches. Water and pitch-black coffee helped, but honestly more to its implementation of deterring me awake than becoming me feel better. The first blunder I constituted that week? On Day 3, I went to a spin class at 8am( a disgust habit I picked up in LA ). Not only did I practically die from starvation that morning, I forgot the parameters of my eating window and consume until 10:30 pm that night. While I fretted I’d messed everything up, and was starting to question how health it was anyway, I woke up on Day 4 “feeling LIGHT”( per my detailed mentions ). My stomach felt flatter, my digestion was good, and my starvation cramps were clearing up sooner. Everything seemed good. And then, as must happen to all diets, the weekend came along. I was investing that particular weekend in Salt Lake City, crashing some friends’ ski tour. ( I don’t ski, I just wanted to drink in a cabin for a weekend .) In readying, I switched my eating window for the weekend to 4pm-12am. After all, if I was going to shape IF my long-term devouring pattern, it had to be something I could do while maintaining a social life. And my social life right now involves absorbing calories after 10 pm. ( I say “involves, ” but truly that’s all my social “lifes” .) I also weighed myself Friday morning, but both of the scales turned out to be broken, and both told me I’d gained 16 pounds in the past two weeks. Throughout the weekend, I felt like the bloating and general gross-ness I’d kicked during the course of its week was back–but primarily I blamed these kinds of food I was devouring( processed garbage and desserts, yum ), and it was more of an internal “yuck” than an “oh sh* t, these breathes are not fun to button.” The final few eras I focused on boozing sh* t tons of ocean, dining more real nutrients and fewer snacks, and fetching my eating window back to a reasonable scope. ( AKA Monday I ate 4-11; Tuesday I devour 3-10; Wednesday I could eat at 2 again .) But candidly, I never fairly kicked the bloated feeling from the weekend and I was still freaked out by the scale cataclysm Friday. By the time I went back to regular eating, it didn’t come a minute too soon. I would need a licensed professional to confirm or deny this, but I suspect that I messed up by making my eating window so belatedly on the weekend. Like I said, I am a chronic night-snacker–which represents I’ve read all the advice on how it’s the worst thing you can do for your mas and how you’re meant to give your mas 2-4 hours of not ingesting before bed. I’ve likewise been a yo-yo dieter for years, and heard rumors of starvation mode( when your body’s metabolic rate slows down bc it thinks you’re dying and necessitate the food) if you deprive your form of calories irresponsibly. Again, IDK for sure what happened, but once I started eating from 4pm-12am it felt like my form panicked, shut down any fat-burning processes, and held onto whatever calories I did spend for dear life. In other texts, with a subsequently eating window, my digestion slowed, my usual bloated feeling returned, and these votes in quickly seemed like a ghastly plan. And while my 2-10pm feeing window had moved “i m feeling” lighter after a few days, it had also let me to stop reasoning so carefully about what I was gobbling. 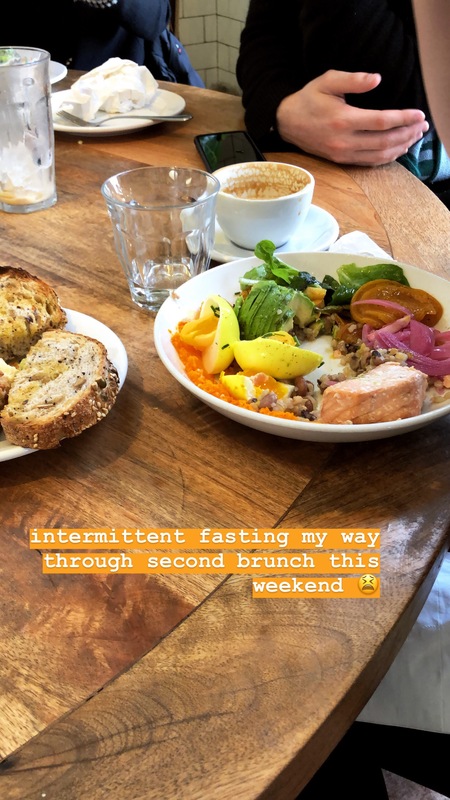 I would try to break my fast with a big, healthy meal, but I was channel more relaxed about carb content, afternoon snacking, and ingesting desserts. As long as I stopped at 10 pm, I was still technically on a diet–right? Yeah, I wasn’t right. People who promote IF assume that you’ll eat fewer calories if granted less duration, but they’ve clearly never been to a timed buffet. I can’t was sure whether I was eating more calories while I did IF, but I truly doubt I was gobbling fewer( and obviously not on the weekend ). And overeating with 16 -hour breaks isn’t a food: it’s exactly devouring the same amount and giving you a better shot at digesting it properly. By the time I procured a less f* cked up proportion that Friday, I located I was two pounds heavier from the whole experiment. BUT–and again I have no way of proving this–I was almost like it was possible that part of that weight amplification was muscle. I’m the various kinds of person who can( and has) temporarily gained two pounds from a large meal, and I’m very familiar with what that would seem to be. This heavines addition, however, felt different. To sum up my very scientific intuition to seeing how my mas changed during this process, I felt like I was roughly the same sizing but less jiggly–like my gasps were maybe a little tighter in the leg, but looser in the waist. It wasn’t my goal, and I still have five pounds I’d like to lose, but I’ve suffered worse results on more pain regimes. Overall, would I recommend intermittent fasting, or ever do it again? Kind of! I would recommend trying a few different chewing windows and determining what works best for you, for sure. I might try incorporating a 24-hour tight once a few weeks, since I’d had good short-term causes with a few epoches of fasting. Eventually, I think incorporating a duo fasting points facilitated me shed some bloat and regulate digestion–but expanding the fasts and flustering my torso on when to expect food backfired. As much as I detest to say it, I have to accept that this wasn’t a “weight loss hack” by any means. If I actually want to see a lower numeral on the scale, I will have to consume fewer calories. Until then, I’ll be accepting gratuities on how the f* ck I’m supposed to enjoy an evening at home without gobbling until the second largest I fall asleep.